The TERGO® URS is a versatile very narrow aisle (VNA) reach truck based on the chassis of the hugely successful Tergo reach truck. The URS is perfect for working in very narrow aisles while providing effective free-range manoeuvrability outside the narrow-aisle store. Featuring 180 degree fork rotation, the Tergo URS is a narrow aisle stacker primarily for use in guided aisles but with free-range ability outside the guided aisle. With transfer aisles as small as 3,700 mm the URS offers the opportunity to maximise space utilisation and storage capacity combined with the ability to free range throughout the whole building. A perfect truck when working in combination with high level order pickers. Resulting in the most suitable truck for stacking operations working alongside the most suitable truck for picking operations. Allowing the operator to concentrate fully on the job of stacking, the truck is guided in the aisle by floor mounted rails or under-floor wire. The load can be raised as soon as the truck is in the aisle providing the performance gained from diagonal lift & travel. Typical work cycle times are 15-20% faster than free-range trucks. Options such as a pre-selector for quickly and accurately arriving at the correct storage level further enhances efficiency. And to provide the operator with maximum visibility a camera and monitor are available. Featuring Dynamic Cornering Control (DCC). The smart technology that provides the best combination of increased safety and high performance. The URS with DCC fitted as standard automatically adjusts cornering speeds to allow maximum performance whilst also maintaining the highest level of safety. With Ergologic all in one joystick control you have effortless control over all hydraulic functions. The neutral posture minimises muscle, tendon and nerve stress. The most ergonomic design in the whole of the fork lift industry. Are you interested in the TERGO URS? Want to know more? Click the button below to view or download the brochure. The URS was the winner of the International Forklift Truck of the Year (IFOY) award in 2015, in the 'Storage Technology Equipment' category. This was the first time UniCarriers participated in the award, and it paid off — the panel of IFOY judges were impressed by the truck and how it performed in a series of tests, in which all participants were assessed on various criteria such as innovation value, technology, design, ergonomics, safety and sustainability. 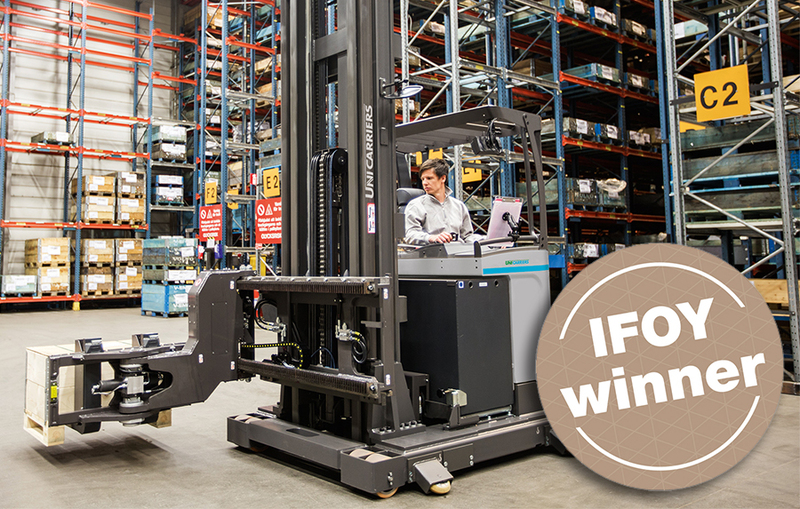 Other UniCarriers products have been entered in the IFOY awards since, such as the EPH order picker in 2017, and the TX3 electric counterbalance in 2019. Great space utilisation with stacking aisles for 1,200 mm deep load from as small as 1,640 mm. This is not a turret truck. It is a compact man down VNA truck, able to lift to 10.35 metres. The smallest transfer aisle in the industry (3,700 mm in rail guidance). Perfect for storing all paperwork and also as a writing desk for admin purposes, or computer terminal safe and protected location. 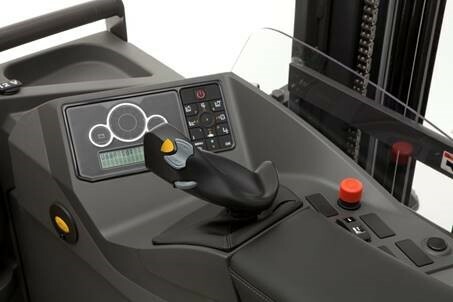 With Ergologic all-in-one joystick control you have effortless control over all hydraulic functions. The neutral posture minimises muscle, tendon and nerve stress. The most ergonomic design in the whole of the fork lift industry. The most robust cold store cabin in the industry with clear all-round vision. Easy entry/exit with complete driver protection insulation. The compact size of this truck eliminates the need for trucks to feed P&Ds. The truck can easily drive to a pick-up location then deliver the load into its VNA rack location. 1 function 1 operation. Most efficient use of driver's time. Built on the reach truck chassis, the URS shares a large number of parts. This ensures spare parts availability and service engineers are comfortable and familiar with the parts.